This article will cover my upgrade to BT’s Infinity service and also provide a guide to setting up a third party router with BT’s DSL and Fibre services. This article includes information on how to configure a DD-WRT router to work with Infinity’s IPTV channels. You can skip directly to the 3rd Party Router guide. After enduring a painful waiting of “will they, won’t they?” BT has rolled through our little City of Wells and completed their Fibre To The Cabinet (FTTC) installation. We can now happily depart the dark age and enjoy Internet speeds of above 17 Mbps. In reality I was making do with 14.5 Mbps download and 0.9 Mbps upload. I opted for the BT Infinity 2 package that offers up to 80Mbps download and 20Mbps upload. It only costs £5 more than the basic 36Mbps package. In theory this sounds like a pretty sweet piece of hardware that BT provides for free to their subscribers. In practice my personal experiences with previous HomeHubs have been a little different. Without turning this into a rant my previous issues were centered around the limited firmware, poor routing capacity, and poor Wi-Fi. The 5 GHz wireless band would only work if you were in the same room, too many connections would cause the HomeHub to lockup and start dropping connections before ultimately disconnecting from the Internet all together and requiring a manual reset. BT’s network monitors connection stability and will increase the Signal to Noise Ratio (SNR) in order to boost signal strength. This is done at the expense of overall line speed. By this point the HomeHub had been reset so many times that our line speed had dropped from 15 MBps to 7 Mbps. Ironically the HomeHub2 was a more solid performer that held up for five years. You can find out the the end of this daring tale over here. Having recently upgraded my home network to use a dedicated modem and router I had all the incentive in the world to preserve this setup as we transitioned to BT Infinity. The available options for modems are somewhat limited, but also offer some interesting options. Currently BT prefers self installations for most of its products and this was made possible for FTTC subscribers with the HomeHub 5 and its inclusion of the required VDSL modem. This was the original that BT Openreach supplied to FTTC customers and was supplied in tandem with the HomeHub 4. There is a dedicated online community devoted to patching the modem’s existing firmware and the user more control and access to line statistics. With only a name a mother can love the ECI was a later addition to Openreach’s VDSL modem inventory. This modem also sports a locked firmware interface, but has also attracted a dedicated modding scene aimed at restoring user access. This is the modem I ended up opting for due to a mixture of price and availability. In this case I was more interested in a stock modem that had not been patched. I will probably explore purchasing a modem for the sole purpose of unlocking it in the future. This brings us to the Billion 8800AXL which is a combination modem and router. I would recommend this modem to most users, especially those looking for a combination modem and router. Furthermore this unit is compatible with BT Infinity TV right out of the box and offers line statistics in addition to other advanced options. BT has at least provided one thread on a few router models that work with Infinity TV. The thread can be found here. This guide will explain how to connect to your BT ADSL or Infinity VDSL connection using your own modem and router. This is the category which I found myself falling under. Having already purchased and setup two TP-Link WDR3600 with DD-WRT I was determined to continue using what has become a stable and feature rich setup. The first step was to purchase a VDSL modem. I found a used ECI modem for £25 and found that to be a good starting point. Unlike ADSL connections VDSL modems are automatically configured and work as long as your line has an active FTTC signal. Once our connection was switched over to infinity the VDSL modem registered a valid DSL connection and started working. Purchase a compatible ADSL or VDSL modem. I have already provided a list of compatible VDSL modems earlier in this article. For my previous ADSL solution I used the D-Link DSL-320B. There is a decent selection of ADSL2+ modems available on the market. The Billion 8800AXL mentioned above works with both ADSL and VDSL connections. The ADSL2+ settings for BT’s network are available here. The most common user name is bthomehub@btbroadband.com and you can use anything for any phrase for a password. When using your modem with a separate router that will be the DHCP server you will have to set the modem to bridged mode. Make sure to configure your modem in advance since you will not be able to access it while it is connected to your router’s WAN port. Purchase a compatible router. Depending on how adventurous you are feeling you can either go with something out of the box or step into the world of Open Source Software. I would recommend making this your first step and preferred solution. Given the recent spike in security concerns over stock firmware, software back doors, and discontinued support there has never been a better time to pursue alternate software options for your equipment. A list of supported devices is supplied by DD-WRT and offers a breakdown of products and their compatibility with various versions of DD-WRT. This section is a great way to confirm if either your existing router or potential purchase is capable of running DD-WRT. One of the virtues of the Open Source community is that forward momentum is often maintained and is flexible to continue improving support, expanding features, and increasing security. For example we saw five versions of DD-WRT in December 2014 alone. This means that DD-WRT allows your equipment to grow and adapt to your current needs. 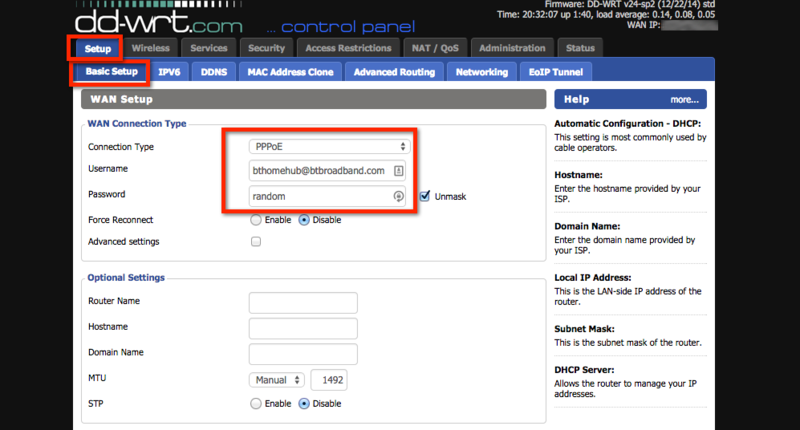 Located under Setup -> Basic Setup you will need to select PPPoE under Connection Type in order to input your BT Broadband credentials. The username bthomehub@btbroadband.com is the most commonly used and is not user specific. The password field can be include any string, as long as it is not left empty. 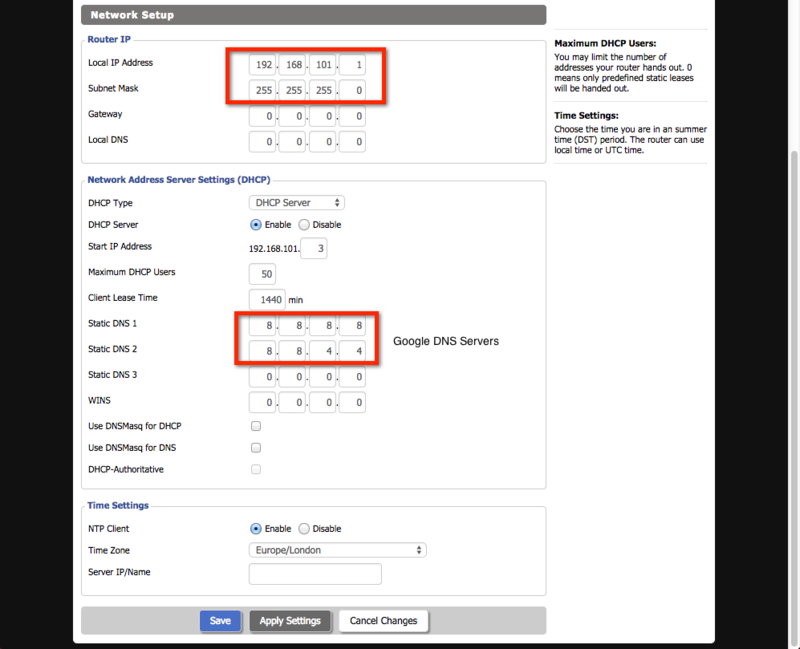 The DHCP settings are located further down the Setup -> Basic Setup page. Select and enable the DHCP server. The Local IP address is what you want your router set to, I have listed an example. The default Subnet Mask is 255.255.255.0 Finally the DNS settings have been configured to use Google's DNS servers rather than BT's. You can just leave them at 0.0.0.0 for DNS 1 and 2 if you want to use BT as your default DNS lookup. Located under Setup -> Networking this will be where you will be able to make your IPTV channels work. 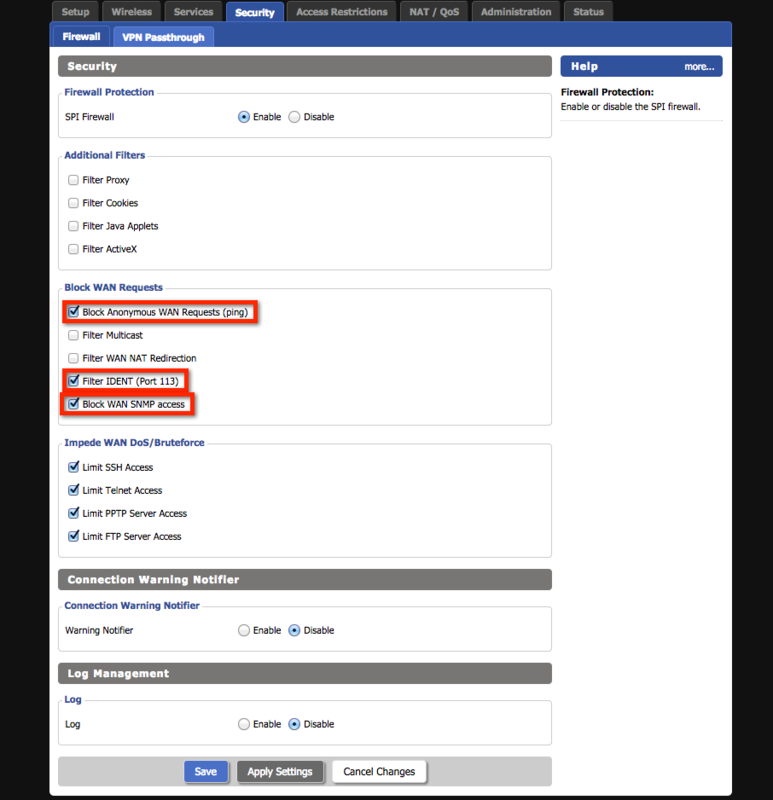 In the Create Bridge section make sure that your configuration includes "IGMP Snooping". This will allow the router to listen for IGMP packets used for Multicast and filter them to the correct devices. The Port Setup can be found further down on the Basic Setup -> Networking page. Once you have configured your bridge make sure that you Port Setup is using it by selecting it from the dropdown menu. This page is accessed under Security -> Firewall. These is a common configuration for most users, where remote access and requests to the router are disabled. Filter Multicast is disable to allow those signals to reach a set top box connected over LAN. UpnP allows media devices to easily and automatically connect to each other. This is commonly used when streaming between devices. 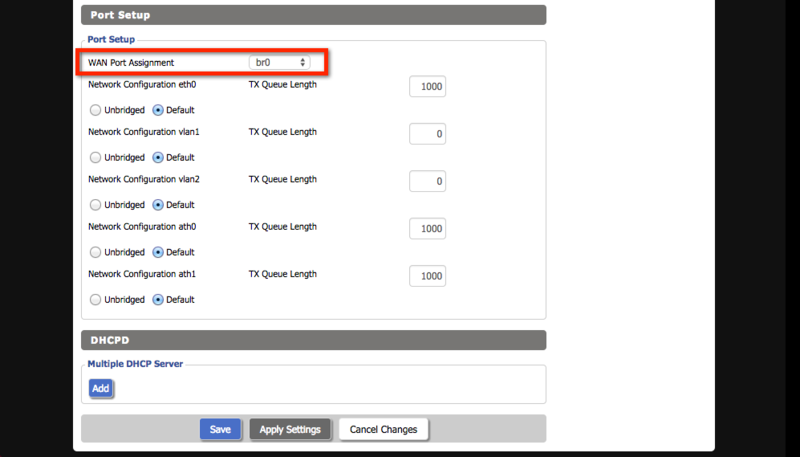 This section is part of the NAT/QoS -> UPnP menu. Simply select the Enable radio button and you are good to go! BT Infinity TV offers subscribers an extended range of channels through the IPTV standard. These channels use Multicast and IGMP technology and require routers that are capable of handling these packets. The number of routers offering these features are rising and more companies are patching this functionality into their hardware through software updates. The DD-WRT version database is available here. Prior to using Infinity I was running an older version of DD-WRT (r21061) which had limited support for IGMP that was not capable of relaying the packets to the set top box. Granted, the version I was running was from March 2013. There had been little need to update on account of its stability and lack of any glaring security holes. After some research I determined that the most recent version (r25697) was stable enough to upgrade to. The new version included IGMP sniffing as part of the Bridging setup under the Setup -> Networking menu. Once configured the set top box was able to receive IGMP packets and tune into the IPTV channels. This will connect to the test channel and saves you a trip to your TV. These settings should get you up and running. I have not included any information regarding wireless configuration since that warrants a whole article on its own. As your setup matures you will find yourself fine tuning and enabling features as required. Especially if you start dabbling in remote management. I hope this article has helped you get your network setup off the ground and answered some questions in the process. Happy hunting! thanks for your excellent post. I now have this working using an OpenReach modem and my Netgear router running DD-WRT. My set top box is connected to the router and this is working fine. I have a second router upstairs that is configured as a repeater/client bridge. I would like to plug my STB in to this router. Is this wireless configuration possible? Can you point me in the direction to make this easier? I have another router set up as a WAP in my case. To do that I disabled the WAN connection type and the DHCP server. As for the wi-fi settings I set them up using the same credentials, spaced out the the channels, and adjusted the signal/broadcast strength in order to fine tune the overlap. I did also setup IGMP snooping just in case. I don’t have a set top box running off the second router, but I would be it works. Since the primary router is already properly filtering IGMP packets. I hope this helps. I will probably put together another blog entry on this at some point. Thanks for the response. I’ll give that a go. By the way, I’m running DD-WRT v24 SP2. Is IGMP snooping something that has to be enabled via a script? It’s not available in the GUI as shown in the images on your post. I read somewhere about it being a kernel feature that had to be enabled? Please have a look through the pictures I included above in order to find the IGMP snooping option. It is easily accessible through current versions of DD-WRT. I advice searching through forum posts regarding the latest builds in order to find out if there are any critical bugs. The build I used when I wrote this post was r25697, but that was with a TP-Link WDR 3600 v1 router. I cannot provide any guarantees with your hardware. To that it’s best to do a bit of research. I am about to update to r27600 that came out today. The version listed above does include IGMP snooping in the Setup > Networking menu. Thanks for this write up, I was able to get the VLC test channel working but no longer had internet access on any other device. My PC is wired as is another Set-top box and both lost connection. When I change my ‘Port Setup’ from vlan2 to br0, I receive the VLC test channel but no internet (I get a DNS_Probe failure), and returning it to vlan2 gets me internet but no VLC test channel. Did you do anything else to separate out the traffic? By the sounds of it you are running multiple VLANs. Have a look at the image of the “Bridging Setup” I have on the carousel above. Under the ” Current Bridging Table” section you will notice that I have added VLAN 1 VLAN 2 and both the wireless interfaces to the br0. That way the IGMP snooping is active across all of those interfaces and the devices connected to them. Scrolling down the same page shows the “Port Setup” section, make sure that your interfaces are bound to br0 from the dropdown and that should do it. I tried to make this as close to an out of the box setup, but there are always 1000 ways to skin a cat when it comes to networking. I hope this helps. Did you manage to connect to a DD-WRT router using BT ADSL? I’m on the outskirts of Wells and am still in the ‘will they, won’t they’ stage. My knowledge of networking is limited (probably an overstatement!) but, from what I can gather, BT ADSL uses a PPPoA connection which isn’t supported by DD-WRT. Here is a link to when I initially upgraded my ADSL setup at home. It didn’t go into specifics over the setup, but long story short you will still use the same PPPoE credentials. The major components are having an ADSL modem that can be put into bridged mode so all it does is pass on the DSL signal and then your router authenticates it. Make sure to have the shortest possible run of phone cable between you modem and outlet as that does have a direct impact on speed. RJ 11 was never made for long runs, hence my running of CAT6 cable in that article. Configure the modem first with these settings before turning off DHCP and setting into bridge mode. Your router will then be responsible for the authentication via PPPoE, DHCP, and NAT. I sense another article coming on that covers this. It’s all up and running now. Your blog/post was really helpful. I was wondering if anyone managed to get this running on any of the more recent DD-WRT builds. I tried to follow this procedure on r29519 but without success. I am running 29837, but I also upgraded into it without a reset. With that said I don’t think there should be anything major preventing you from configuring your settings. Can you have a look and provide a specific example of where you are getting errors? Try typing in your router’s address again. Confirmation pages can timeout. Depending on the router’s model bricking tends to be indicated a lot of flashing lights. Also did you flash from default or upload the upgrade .bin file? Did you get BT IPTV running on any of the recent build as well? Your post refers to an older build but so far I have not been able to find evidence that it also works on the newer builds. If not, then I will try r25697 which is the version you said for sure works when you wrote this post. I have not had any problems configuring IGMP to enable IPTV on any of these builds using the above guide. I’m currently using r30605 and have been updating firmware and not resetting the router when promising builds come up. I did at some point in the last year perform a fresh installation on both my routers. My current networking table is exactly the same as the one pictured above. Can you remember how you set the ECI B-Focus V-2FUB into bridged mode? For out of the box compatibility I bought a used ECI Openreach modem. These are already set to Bridge mode at the expense of being locked down. If you have an unlocked modem, connect it to your computer, match its IP address (assuming it has DHCP enabled), and log into it. Try fishing around for default credentials. From there it will be a matter of matching the VDSL VPI settings for your ISP. I haven’t had a look at the innards of this modem so that’s about all I can say at the moment. Alternatively the Draytek 130 is a good open firmware modem that you can set to Bridge mode as well as having access to. Thank you for this guide, it has been a great help in getting setup with BT Vision. However i am stuck on one point and i was hoping you may have some updated information. Back in 2015 Marty posted that as soon as he switched to br0 as the WAN port it killed his internet. I have the same issue myself. I assign vlan 1 and 2 to br0 but as soon as i switch to br0 the VLC test stream works but no more internet on wifi or Ethernet. 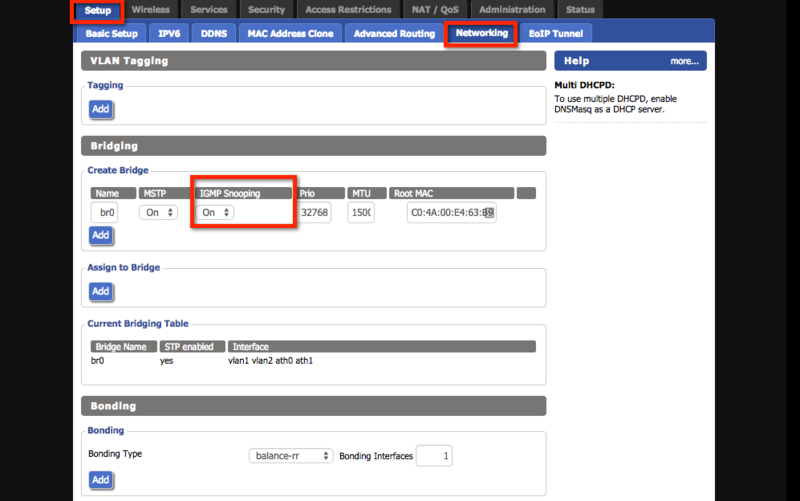 Looking further down on the port setup page you should have the option to set the WAN port assignment, in this br0. Then configure the interfaces you want included in that bridge. Those would include your VLANs, ethernet, and Wi-Fi. The carousel has an example image following the Bridging setup. Each router might be a little different, in my case it’s an Atheros chipset. Hence the Wi-Fi is ath0 and ath1 for the 2.4 and 5GHz bands. I have recently purchased a Linksys WRT3200ACM to replace my BT Home Hub 5. The Linksys is connected to an BT Openreach modem Unfortunately I am stuck trying to get my BT TV subscribed channels to work. There appears no set up for IGMP on the router. I don’t know if the Linksys firmware support IGMP. If it’s a newer router most the manufacturers released updated firmware to support Multicast. I would first look into whether Linksys has supplied that in their latest release. Otherwise this router is DD-WRT compatible. The link to the latest build is below. There should be several guides out there on flashing this router. I’ve been personally eyeing up the Linksys WRT1900ACS as my next DD-WRT project, but am waiting to confirm whether Virgin Media has fixed their broken Modem mode on the Super Hub 3.